Flatspace is a space exploration game set in the distant future, when the universe has expanded so far that planets and stars have distintegrated. Humanity still exists in space stations. 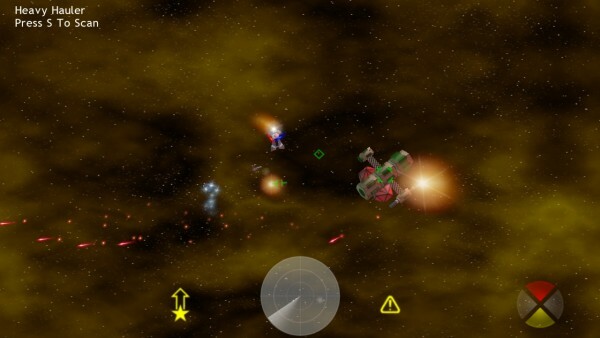 The objective in the game is to locate and assemble parts of a galactic hyperdrive, however there is a lot of freedom for the player and as a space captain, you decide how you want to play. To make a profit, you could opt to trade cargo between eerie space stations, or become a space pirate and steal cargo. You can join the police force, or become a bounty hunter and track and destroy the most wanted criminals in the galaxy. You can mine asteroids, act as a high speed courier or taxi paying customers from sector to sector. As a space captain you can fly any of over a hundred ships in the Flatspace universe, providing you can afford the price tag. Ships can be customised to your will or requirements with many different fittings. Weapons, shield units, generators, trackers and scanners, tractor beams, stun beams, mines and missiles and many more items. Fragtopia (Review Extract): "...At $20 you can't beat Flatspace for value. It's an addictive little game, with a unique type of gameplay. I've been playing it on and off for quite a while now, and I'm not even close to exploring the entire universe or getting bored..."
Game Tunnel (Review Extract): "Having a huge game like this with everything being dynamic and having it all come out as nicely as it did is amazing. What would have made it nicer is some kind of story mode, but with what Flatspace already provides, you can still expect to see a lot of interesting things happening in the game... with the huge world, incredibly dynamic A.I., and sheer number of things to do, Flatspace should provide plenty of hours of diversion..."
The last update to this original Flatspace game was in 2005, so it might struggle to work on modern computers. You can buy Flatspace using the Digital River link below, but please download and try the demo version first to ensure that it will work on your computer. I have dreams of remastering this game for release on Steam, and if that happens, all existing customers will get a free copy of the remastered version. See Flatspace IIk to play the latest incarnation of this, my most successful game.